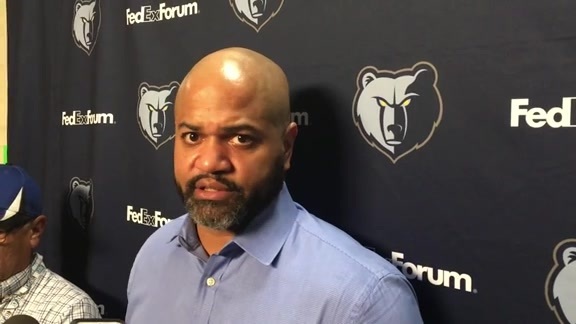 J.B. Bickerstaff talks with the media about Monday’s matchup with the Rockets. Gasol talks about his arm soreness that impacted him and the costly turnovers in loss to Rockets. 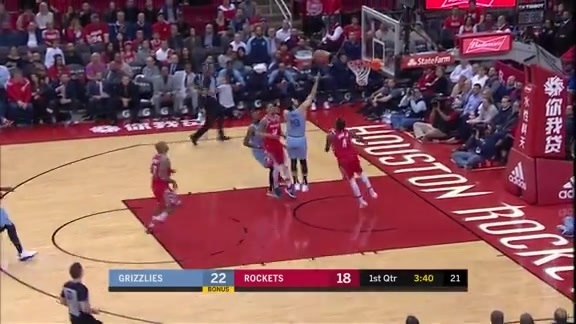 Check out the top plays from the Grizzlies match against the Rockets on Monday in Houston. Mike Conley scores a team-high 14 points Monday night against the Rockets. Mike Conley somehow gets this shot to go. 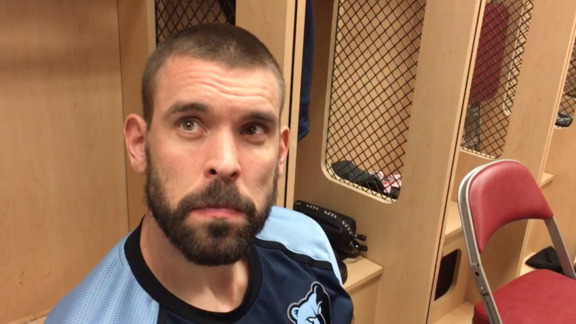 Mike Conley finds Marc Gasol as he slams it home. JaMychal Green picks the Rockets’ pocket before passing the ball to Omri Casspi who finishes with the layup. 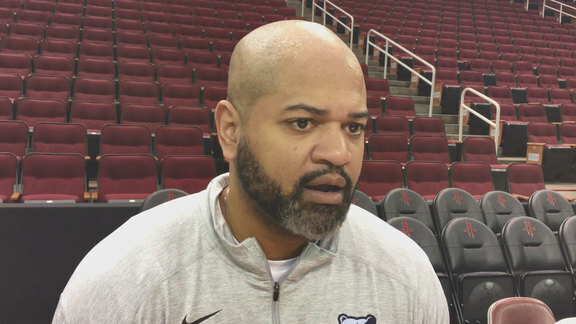 Grizzlies Head coach J.B. Bickerstaff speaks with Grind City Media's Michael Wallace at Toyota Center as the team prepares to take on the Rockets. Mike Conley scored 14 points and handed out seven assists. All of Conley’s points came in the second half. James Harden scored 57 points for the Houston Rockets as the Memphis Grizzlies fell 112-94 on Monday night in Toyota Center. The Grizzlies dropped to 19-24 on the season and 8-15 on the road. The Rockets improved to 25-17 overall and have won nine of their last 10 games. Memphis committed a season-high 24 turnovers, allowing 27 points off them. The Grizzlies’ previous high was 21 at San Antonio on Jan. 5. Houston committed 14 turnovers in the game, leading to 19 points for Memphis. Mike Conley scored 14 points and handed out seven assists. All of Conley’s points came in the second half. Garrett Temple also finished with 14 points (4-6 3P), cracking double figures for the 21st time this year. Jaren Jackson Jr. added 12 points and a game-high three blocks. Jackson Jr. has scored 12 or more points in seven consecutive games, the longest double-digit scoring streak of his career. Omri Casspi also had 12 points and a couple steals off the bench. Casspi has reached double-digits for the sixth time this season and the first time since Dec. 17 at Golden State. Shelvin Mack chipped in with 10 points and seven assists. Jevon Carter finished with eight points (2-4 3P) and two assists in his first career start. The Grizzlies outshot the Rockets in the game, making 36-of-71 (.507) shots compared to 37-of-84 (.440) by Houston. The Rockets made eight more three-pointers however, going 18-for-48 (.375) while the Grizzlies were 10-for-22 (.455). Memphis struggled at the free throw line, going 12-for-22 (.545) while Houston was 20-for-22 (.909) at the stripe. The Grizzlies outrebounded the Rockets (43-36), but Houston had more second chance points (14-10). Harden set a new season-high, and has now scored at least 30 points in 17 consecutive games, surpassing Kobe Bryant for the most in NBA history. Harden has also now reached 50 points three times this season. Danuel House Jr. finished with 15 points. Austin Rivers finished with 14 points off the bench, scoring 8 of them in the third quarter. The Grizzlies improved from their third quarter, going 10-for-19 (.526) from the field in the fourth, but only made one three-pointer in the period. Memphis also outscored Houston 18-8 in the paint during the final quarter, but couldn’t overcome the 17-point deficit they began the quarter with. The Rockets made 13-of-28 (.464) three-pointers throughout the second half. Houston found their shooting stroke coming out of halftime, connecting on 11-of-21 (9-16 3P) shots. Memphis shot efficiently, 8-of-19 (3-7 3P), but continued to mishandle the ball by turning it over seven times in the period. Rockets used an 11-0 run from 5:12 to 3:17 in the quarter to build a lead 87-70 at the end of the third. The Grizzlies started the game hot, making 5-of-9 (.611) threes in the first quarter, with Carter and Temple each hitting a pair, and shooting 11-of-18 (.611) from the field. Memphis assisted on nine of their 11 baskets, but committed six turnovers during the quarter. The Rockets struggled, going 3-for-10 (.300) from three and 8-for-22 (.364) from the field, but Harden scored 15 points in the quarter. The teams traded leads seven times, but the Grizzlies went on a 10-0 run that lasted 2:08 to help lead 29-24 at the end of the first. Harden continued to lead the Houston offense in the second quarter, scoring 21 of the team’s 30 points in the period. The Grizzlies shot well enough in the quarter, going 7-for-15 (.467), but turned the ball over eight times, tying a season-high. 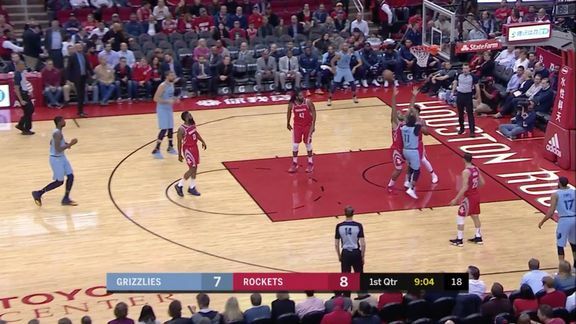 The Rockets scored 12 points off those Grizzlies miscues, while committing four turnovers and conceding four points of their own. The Grizzlies will return home to try to sweep the season series against the Milwaukee Bucks on Wednesday, January 16 at 7 p.m. CT in FedExForum Tune in to FOX Sports Southeast presented by Pinnacle Financial Partners or listen on 92.9 FM ESPN to follow the action. Fans who want to support the Memphis Grizzlies and purchase 2018-19 Season Tickets or 10-Game Flex Packs can do so now by calling (901) 888-HOOP or going online to grizzlies.com/tickets. Single Game Tickets are also available for purchase at the FedExForum Box Office, all Ticketmaster locations, ticketmaster.com, online at grizzlies.com/tickets or by calling 1-800-4NBA-TIX. For more information on the Grizzlies, ‘like’ Memphis Grizzlies on Facebook or follow on Twitter and Instagram (@memgrizz). He’s a hell of a player obviously. They make it difficult on you. We were trying to get the ball out of his hands some, but they move the guys on the perimeter around and they put him in different spots on the floor, so he’s hard to find and where you’re going to bring the trap from, so you can get the ball out of his hands. They put all those guys on the floor that can shoot it around him. There’s so much space, so you have to give them credit and give him credit just for the talent he is and the impact that he has on the game of basketball. That’s the thing about their team. They have firepower all over the floor. You look at some of the shots that Gerald Green hit and guys were closing out on him, and they were there on arrival, and doing all the things that we teach. He shot one from his right hip pocket and it went in from the corner. When you put shooting on the floor like that, and spacing, and skill, you create those opportunities. They put a ton of pressure on defenses and those guys made shots. That was the key to it. You turn the ball over 24 times, those are just empty possessions and you’re playing a team that has this type of firepower, you can’t waste possessions, and you turn it over and we missed those possessions where we don’t get a shot on goal. 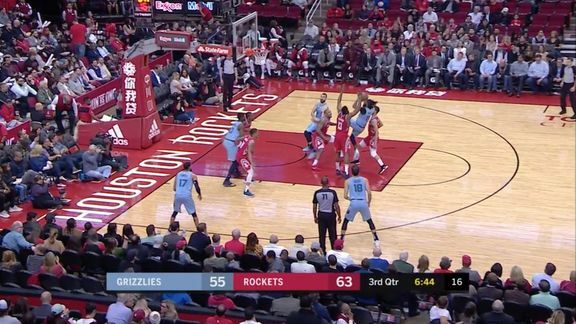 You get a shot up, at least you get a shot up, an offensive rebound, a make and now you have to take the ball out of bounds; but if you’re missing, if you’re not even getting attempts it puts so much pressure on your defense versus a team like this. You definitely can’t afford that. I thought we turned the ball over a little bit there and they got some easy ones. 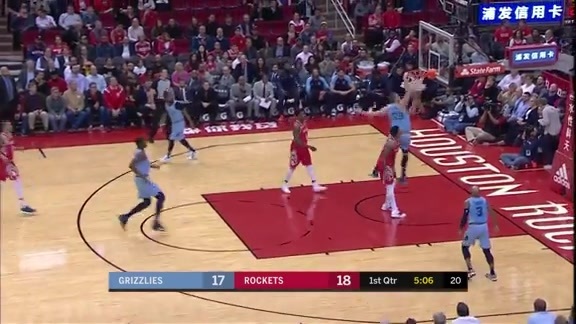 He (James Harden) started making plays for other people and he started getting the ball out of his hands quicker, and the other guys started making a lot of shots and started making the extra passes. Our offense never gave ourselves a chance. We were careless with the ball, myself included, and once they got up and feeling good about themselves, everybody was shooting every kind of shot and they were making them. The last time we played him, we doubled him and we forced some turnovers and it really got us back into the game, so tonight it just happened to be the opposite. When we doubled him and sent guys at him, we got caught in rotations and they made extra plays, and that’s where you have to credit the other guys on their team. P.J. Tucker, (Danuel) House (Jr.), all those guys making extra plays for each other and getting easy looks. They did a good job of keeping their spacing. They do a good job of mixing and changing guys, and positioning, and he has counters and reads for pretty much whatever you throw out there. Then we got a little frustrated and went away from the game plan for a minute, but he still made some tough shots. I lost feeling in my shooting hand and I couldn’t’ get it back. I tried to get it back and it was hard to get feeling in my shooting hand and play effectively without (any) feeling. I tried playing more with my left hand and pass more with my left hand, but even just dribble the ball on the ground; I got no feel back from my hand. It feels better (now). Once I warmed up in the second half, it felt a little better. We’ll see. It happened on the foul – on the up and under, the first time I got to the line. I got hit on my elbow and right away, I lost the feeling. We wanted to guard him with all five, force him into the paint, and try not to foul him. The biggest thing was to try not to foul him and make him shoot contested shots, but don’t contest too much, because he finds ways to get the whistle on that as well. Early on, he was still scoring and only had one assist in the first half, and we were down six points. He was scoring a lot. As a team, we were doing pretty decent, but our turnovers really hurt us in the first half and second half. The other players were able to really get involved and started feeling good. At that point, obviously James (Harden) was already hot. When Gerald (Green) starts hitting threes and Austin (Rivers), and (Gary) Clark, I think that’s when the game got away from us. (Gerald) Green went 0-5 in the first half, and as a team they only shot 40 percent in the first half, and they got a couple of open ones to fall, and they weren’t hitting anything in the first half. James (Harden) was hitting everything, and when they started making shots, then it was tough to guard them. That was the plan to start and get the ball out of his hands, and the reserves and other guys started making shots. Garrett Temple also finished with 14 points (4-6 3P), cracking double figures for the 21st time this year. Jaren Jackson Jr. added 12 points and a game-high three blocks. Jackson Jr. has scored 12 or more points in seven consecutive games, the longest double-digit scoring streak of his career. Omri Casspi also had 12 points and a couple steals off the bench. Casspi has reached double-digits for the sixth time this season and the first time since Dec. 17 at Golden State. Shelvin Mack chipped in with 10 points and seven assists. Jevon Carter finished with eight points (2-4 3P) and two assists in his first career start.